Amsterdam – the capital city of the Netherlands – is a world famous tourist destination. The city welcomes over 10 million visitors per year to its museums, narrow streets, canal bridges and Red-light district. Amsterdam is relatively friendly to tourists with a plethora of different options for accommodation, dining, visitor attractions, and – most importantly – transport around the city. Before visiting the “Venice of the North,” you might want to learn about the different ways you can move yourself around the city. The easiest way to travel around Amsterdam city centre is, simply, to walk. The city centre is small enough to walk from one end to the other in less than 30 minutes if need be. Realistically, you’ll want far longer to do that distance of course. Amsterdam is a flurry of winding narrow streets filled with countless independent shops, stunning canals lined with rows of 17th century houses. Walking offers the perfect way to take this all in – you can meandre between the narrow streets, window-shop, discover quaint back-alleys, and observe the cultural vibrancy of the city. Beware however, Amsterdam’s narrow streets were not built for the swathes of tourists who are doing exactly the same thing as you are. Prepare to get stuck in some crowds slowing you down if travelling on foot, particularly in the summer months. You need also to be aware, as a walker, of the millions of bicycles zooming along the streets, which can be a hazard if you aren’t savvy enough. On top of bicycles, remember to also beware of the many trams – they are deceptively quiet. This post would not be worthy of its name without mentioning the trusty bicycle. Amsterdam is perhaps the most bicycle-friendly capital city on the planet, and it shows. The overwhelming majority of non-walking journeys made in the city are made by bicycle, with essentially every Dutch person over the age of five trained in two-wheeled travel. For tourists, cycling around Amsterdam is also an easy way to get across the city centre, or out to the outer regions. Just remember to obey the rules of the road, watch out for trams and mopeds, and ride safely. There are a number of “dock-less” bike-hire schemes which require only an app and a credit card number to use. This is an extremely cheap and convenient way to cycle, since you don’t need to worry about bicycle security. Remember that although the instructions and app tend to written first in Dutch, there will also be an English option since the English is so widely spoken within the country. One of these operators, “Yellow Bike”, even operates their own tours. There are also many “classic” bike-hire companies who will loan you a bicycle for any period from one hour up to several days. These are more expensive than “dock-less” hire schemes, but may be more accessible to those inexperienced with using their smartphone to conduct transactions. You can find bicycle-hire shops all over the city centre – but watch out, those shops near the main sites and in obvious view of tourist hot-spots will charge a premium (as is the case, of course, with many businesses worldwide). 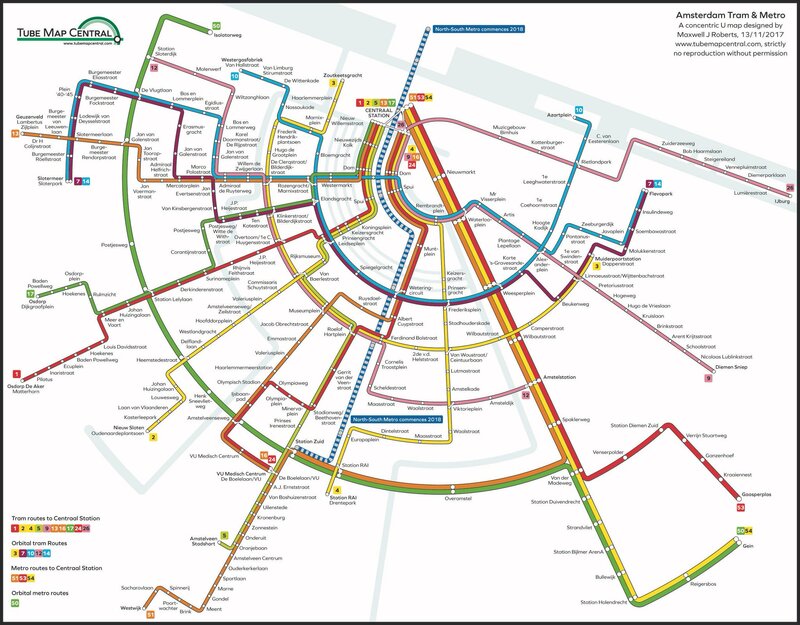 Amsterdam also has an excellent, comprehensive and punctual tram network. Trams go through the city centre out in every direction, converging at the main train station, Amsterdam Centraal. They run frequently – every 10 to 15 minutes or so – throughout the day and even into the late evenings. We found this very handy on our recent visit to the city, given it was often below freezing temperatures when waiting at the tram stop! Ticketing is fairly simple – you can buy singles, day tickets, or multi-day tickets (see the options here: https://en.gvb.nl/ontdek-amsterdam/gvb-dag-meerdagenkaart). They are priced fairly and I would say they are very good value. You can buy your tickets from the staff member inside the tram when you board – they are very helpful and will explain which ticket would be best suited to your needs. All tickets are issued as contact-less cards which you tap against a reader near the doors to “check in” to the tram (and tap again to “check out” when disembarking). The tram system – although efficient and quick – can still be intimidating for some. Remember to look both ways when crossing roads to approach tram stops – there are often cars driving over the tracks – and beware of the narrow platforms when waiting for the tram. You also need to remember to get off the tram at the correct door – some are exit-only, others are boarding only – and of course, to tap in (and out!) with your contact-less ticket on every journey. Ultimately, Amsterdam offers a broad range of options to move around the city. Although visitor attractions are concentrated in the city centre, there is enough flexibility between trams, cycling, and walking to offer an efficient and value-for-money mode to travel almost anywhere in the city limits. Let’s not forget that there are other modes of transport too within in the city. Taxis, regional rail, and even the relatively unknown Amsterdam metro might be your best options in the outer areas of the city. Your best bet is to in work out in advance of your journey which mode best suits your needs. How did you travel around Amsterdam when you visited? Did you mostly walk or use a bicycle, or stick to trams or even taxis?